St. Patrick’s Island Park in Calgary, Alberta, Canada, designed by Denver, Colorado, urban design and landscape architecture firm Civitas Inc. and W Architecture and Landscape Architecture of New York, has been awarded a 2017 International Architecture Award by the Chicago Athenaeum Museum of Architecture and Design and the European Centre for Architecture Art Design and Urban Studies. In addition to receiving the prestigious annual award honoring “new and cutting-edge design worldwide” for the revitalized nature-in-the-city park, Civitas has taken on additional projects in the Canadian city, from updating the playground on St. Patrick’s Island to taking a lead role in creating a master plan vision for a new downtown art and culture district in Calgary’s East End neighborhood of Victoria Park, which includes the historic Calgary Stampede. Civitas’ vision for Victoria Park will “honor and integrate previous and future plans and projects” in the city’s East End area, explains Civitas founding principal Mark Johnson. 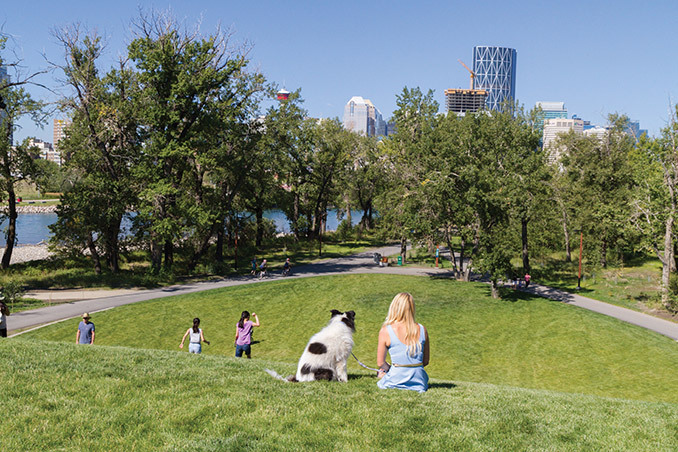 The firm’s new work will build on the success of St. Patrick’s Island Park, which was instantly embraced by downtown Calgary’s East Village neighborhood as an integral part of the community. In addition to the just-announced International Architecture Award, St. Patrick’s Island Park’s numerous honors include being named 2016 Great Public Space by the Canadian Institute of Planners (CIP), inclusion in Fast Company magazine’s 2016 Innovation by Design Awards and receiving the 2016 Excellence on the Waterfront award from the nonprofit Waterfront Center. A European traveling exhibition of the 2017 International Architecture Award winners, titled “The City and the World,” will premiere in Athens, Greece, Sept. 8 – Oct. 31, 2017. A complete list of the award winners is available here.